Add a touch of elegant harmony! 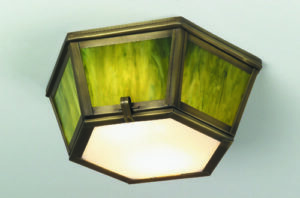 Lighting by Hammerworks Craftsman Style Ceiling Light Model ACCL360 is shown handcrafted with solid brass & amber glass for a harmonious effect. For your convenience we make this Arts & Crafts Lighting ceiling fixture in a larger size as well. Solid copper and verdigris finishes also available along with a variety of glass color choices. Of note our glass color selections include clear seedy, white opalescent and amber among others. In addition we supply the ceiling light with 2 medium base sockets rated for up to 60 watts each. This allows plenty of illumination. Whether you prefer the ACCL360 or the Craftsman Style Ceiling Light ACCL371 an Arts & Crafts flush mount light is the perfect solution. While you can place them in an entryway or a mud room they are appropriate anyplace you need overhead lighting. Choosing a Craftsman Style Ceiling Light allows you to achieve a harmonious look throughout your Arts & Crafts home. If you want to carry the Craftsman theme throughout your space our Arts & Crafts Hanging Lights are the perfect answer. 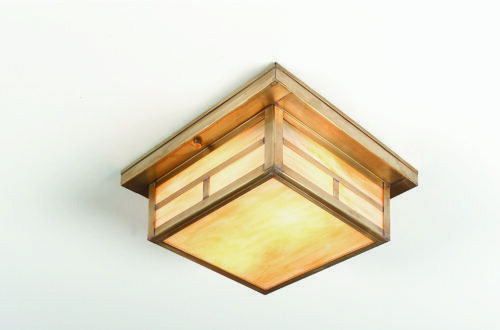 If you like the look of the ACCL360 you’ll love the combination with the Craftsman Style Brass Hanging Lantern ACH337. Of course we have several other Arts & Crafts Style hanging lanterns to choose from in a variety of sizes and styles. We provide all hanging fixtures with two feet of matching chain and a ceiling canopy. Also your Arts & Crafts Hanging Light is fitted with a single down facing light socket rated for up to 100 watts. Finally our Arts & Crafts Lighting Collection also includes Post & Wall Mount as well as Craftsman Style Wall Sconce styles. Therefore you can easily use Craftsman Style Lighting fixtures throughout both interior and exterior areas of your home. Furthermore since all of the Arts & Crafts Lighting is made out of solid copper or brass, even the Arts & Crafts Ceiling Light or Arts & Crafts Wall Sconces are suitable for any covered outdoor area.